Weeeellll, experiment number one turned out two mediocre motifs; the silk ovale thread is too big for the tiny motifs, so the results are clunky, if shiny. Big sigh. I had hoped experiment number 2 would be all about improving the stitch quality; instead, I have to get new thread! 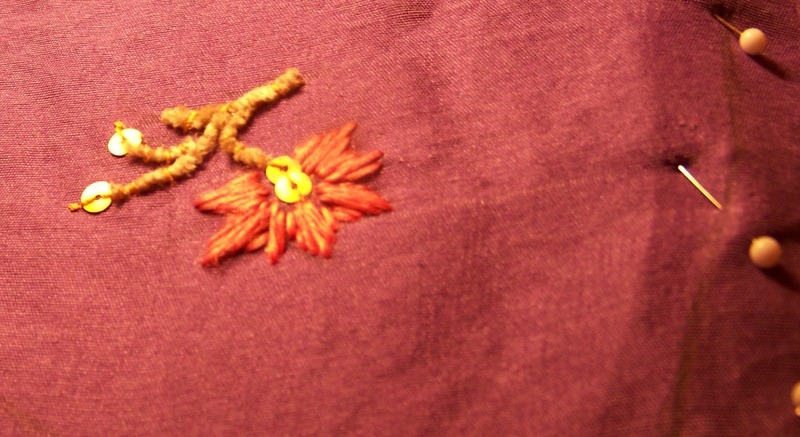 Here are the two motifs, embroidered on a side piece so as to be relatively hidden. If you look carefully, you can see the drawn lines that mark the edges of this side piece. The pins have been used to attach the silk to the edge of my impromptu embroidery frame. 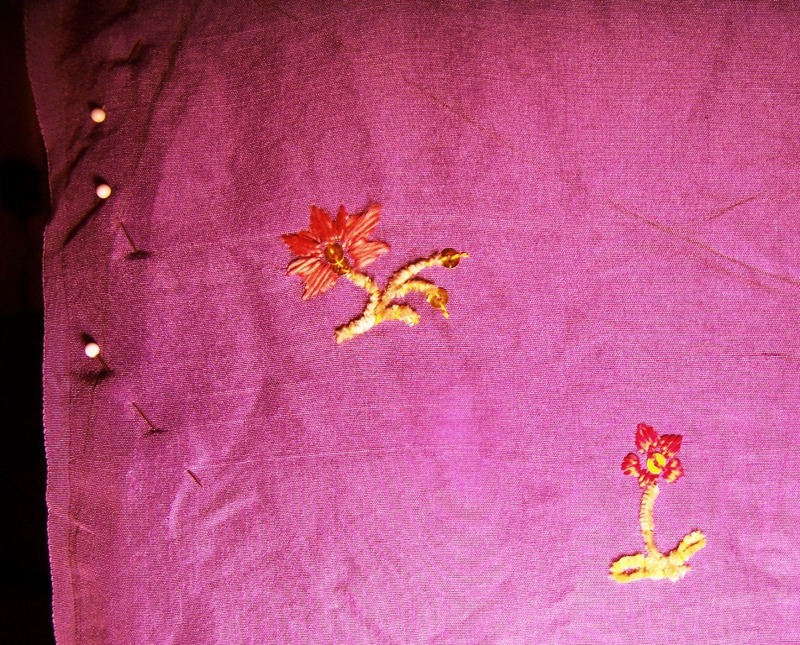 The fabric color is corrected to be as close to lilac as possible; the appearance of the petals is a little redder than it should be, but the shine is decently accurate; the thread shines like crazy and it is also taking on the yellow of the incandescent lamp the work has been placed next to. The petals are sewn with Au Ver a Soie soie ovale from Hedgehog Handworks, the stems and leaves with Hand-Dyed Fiber's silk chenille, narrow width, the gilt spangles from Berlin Embroidery, and spangle and couching thread in Au Ver a Soie Paris twisted silk (a great all-rounder!). What are the designs I am working from? The sprigs from the Met sleeveless spencer, of course! It was those sprigs that drew me to the funny little garment to begin with. They are handsome little things, not quite high fashion, but not totally naive or provincial, either, and the level of work is nice, when one considers that each motif varies, I estimate, from under an inch to a bit more than an inch and a half high. 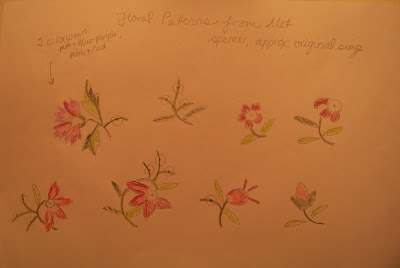 I copied the designs as nearly as possible, and colored them in, in pencil, marking the direction of the embroidery threads as well as I could. The colors are a little off compared to the original: I don't have the neccessary shades in my pencil set, or in my embroidery threads, come to think of it. Am going for the spirit of the designs, not a total copy; after all, I am not using that shade of sea blue silk! The soie ovale has a sheen like no other thread. Made up of lots of silk filaments, it is untwisted, so it can be made to lie flat and display the full shine of the filament. Being untwisted, each filament is gossamer, like a spider's thread. Together the filaments make rather a thick strand. Mary Corbet describes this silk as having body, and she is right. The strand is almost impossible to divide into smaller strands, because it's just one bunch of filaments. The strands fuzz and bunch if disturbed by too much handling, and lose their perfect smoothness, even after being run through the fingers. A closeup of a motif. The Met spencer: closeup of stitchery. ﻿﻿The soie ovale is interesting to work with. It is slippy, it is slidy! It comes off the needly! Even with a size ten or eleven needle, it slithers out of the tiny needle eye very easily. Further, the filaments catch on the fingers, so it's best to have soft hands, not work-roughened ones -- which for this gardening, child-rearing lady, a big Ha! to that -- and to moisturize them well. Laying the threads in laid stitch with a laying tool is essential. Thank goodness it is pleasant and produces a nice flat surface, although I have some glitches, this being my first time at it. And the glow, the wonderful, wonderful glow, pure color that gleams back at you. Even with its challenges, I like working with soie ovale and with much more practice and the right project, should get handsome results. Mixing embroidery materials and stitches happened a lot, it seems. In my explorations of 18th century embroidered garments that have good close-ups (see my Pinterest board), I have found tamboured silk and chenille coexisting, flat or spun silk and chenille coexisting, and goldwork coexisting with both. 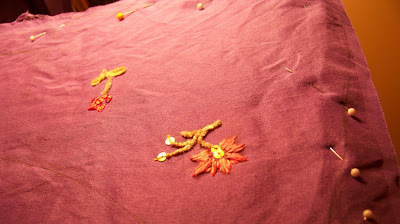 So it was with confidence that I decided to do the spencer's floral motifs in a mix of flat silk, silk chenille, and gilt spangles. The silk chenille is fun to work with. I love couching work, and the chenille silk is just plain cute. If you like cats, or any fuzzy animal, really, you'll like silk chenille: it teases you to pet it. Mmm, mm, good: silk chenille on the spool. Once I learned to keep the chenille on the reel while couching it down, rather than cutting short lengths, it was easier to work. Short lengths bounce around and are hard to coax into shape. The ends are a bit fussy; you have to secure them with an extra couching stitch and then snip off the end with the point of your scissors right on your fabric (eep!). Shaping the stems and leaves requires forethought, like tambour work or fine soutache work. You have to figure out how, and if, you can run a continuous piece of chenille in order to avoid lots of tiny lengths. I will be experimenting awhile, as I explore how doubling back on the chenille to keep going with one strand, and placing one layer over another and so hiding colors when a contiuous color is not wanted, works. This project won't require much of that, though. Others will; I note that some extant garments keep to really simple shapes and few tones, while others are like silk painting in chenille, with lots of tiny bits of color impressionistically used to create gorgeous, rich, shaded flowers and swags. Even with practice, this embroidery will be slow; I am rather chagrined if I bore you. 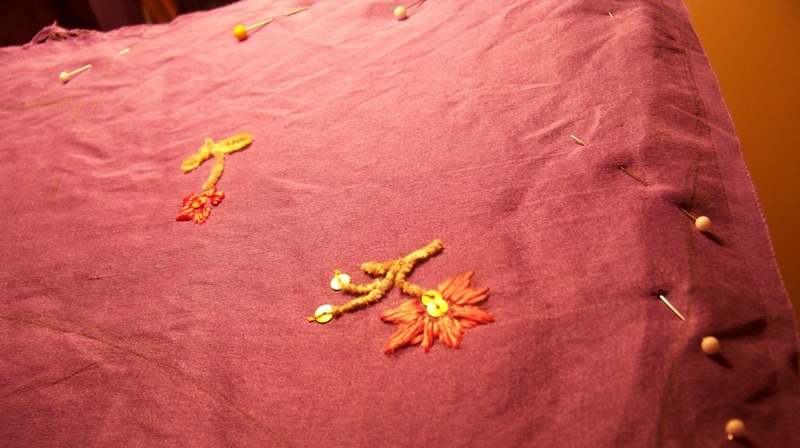 Each petal stitch is carefully placed and laid with the laying tool. The stems and leaves are faster. 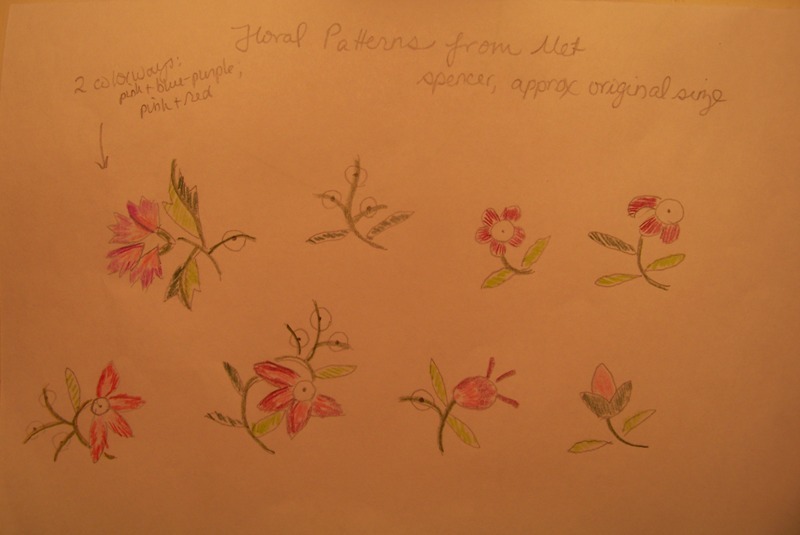 I expect two motifs per hour-plus session, with one motif per session when it's a carnation. Since the Met spencer is sparsely embroidered, I have perhaps twelve to fifteen hours ahead of peaceful, peaceable, meditative enjoyment, spread over weeks. Very little happens fast on this blog, does it? How very un-21st century. That means, next up you'll probably be treated to a petticoat post. Natalie, while I can see why you are not happy with the results, given the examples, I think it is utterly fabulous!!! Just glorious! This is not even reomtely boring, it is edge of seat stuff! And now I quite irrationally want to stock all of these things in my shop, even though the only person in my whole town likely to buy it would just get it off the internet! heehee! Your embroidery is going to be so beautiful! I can't wait to see the final result. The spencer will look stunning! 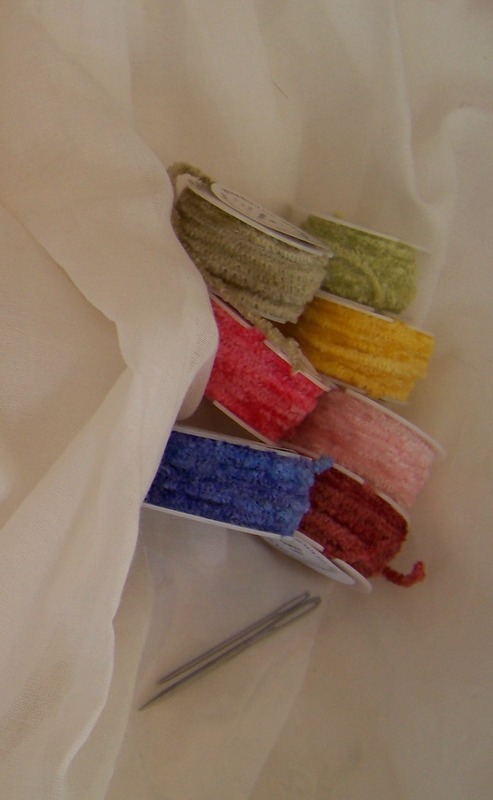 And I love your description of the chenille thread - lol! Good morning, both of you, how're things today? Are you stocking floss in Made Marion, Mrs. C? If so, let's see how the Eterna Silk turns out. It's inexpensive, here, anyhow, and can be used for crafting, too: think tassels and braiding and the like. Love the colors. Can't wait to see it finished! Thank you very much! 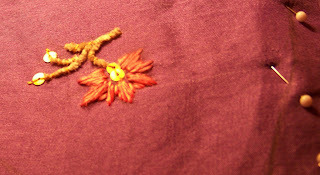 I have the new silk thread ordered so hope that the embroidery will soon be underway again.